Short-run production aluminum job ordered in quantities of 200 to 300 per month. It's a combination of both lathe and mill work. After cnc machining is complete the part is anodized blue. Unlike most other finishes, anodizing preserves the natural luster, texture, and beauty of the metal itself. The anodized coating is hard, durable, will never peel, and, under normal conditions, will never wear through. Anodizing is a process for finishing aluminum alloys that employs electrolytic oxidation of the aluminum surface to produce a protective oxide coating. 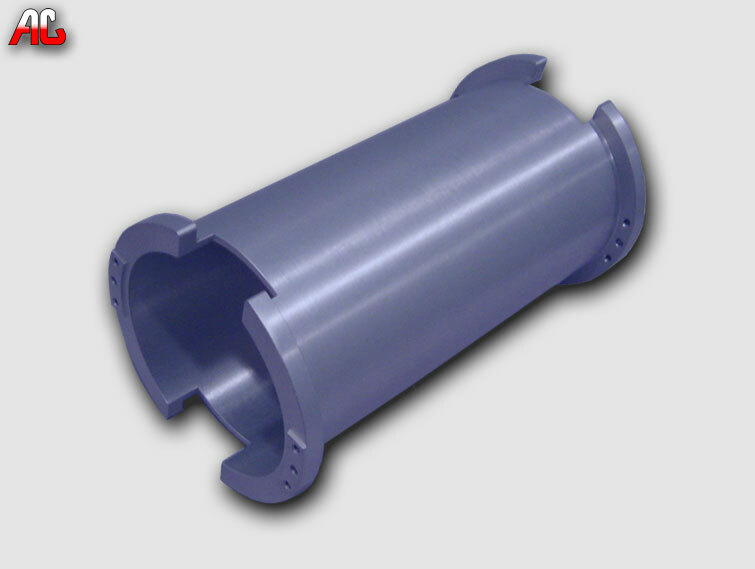 The anodic coating consists of hydrated aluminum oxide and is considered resistant to corrosion and abrasion. Conventional coatings are 0.1 to 1.0 mil thick and are essentially transparent but they may be colored like sample above. Anodizing takes place by immersing the work in a series of solutions where various operations are performed. The solutions are held in open top tanks and the work passes through each unit. The work may consist of a continuous coil of aluminum, in which case it is threaded through the system on rollers. In the metal fabrication business, the work typically consists of distinct items that are placed on special racks and carried through the process in batches. The work is rinsed thoroughly after each operation to avoid contamination and interference in the next solution.